The betting site PredictIt.org is taking bets on whether or not Anthony Scaramucci will last a month as White House communications director. Opening bids are solid. 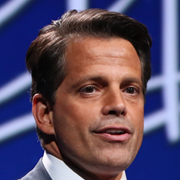 Will Scaramucci be gone in August 2017 or earlier? Right now, you can buy yes for 22 cents or buy No for 85 cents. Will he leave in September (buy yes for 49 cents) or October (49 cents). B1) August 2017 or earlier? “The Mooch” so far impressed the pro-Trump base with his introductory press conference, where he vowed his commitment to winning and blew a mocking kiss to reporters. Then he made what he called a “rookie mistake” by calling up New Yorker reporter Ryan Lizza and making disparaging comments about Reince Priebus and Steve Bannon. Scaramucci seems convinced that Priebus is leaking news — including the mundane item that former Fox News president Bill Shine and Sean Hannity were having dinner with the president. Scaramucci is also angry after his personal financial records were leaked to the press. Scaramucci said on Twitter that he will not make the “mistake” of trusting a reporter again. President Trump, unfazed, is in Long Island talking about his efforts to stop the illegal gang MS-13.